I was a bit nervous about our stop in Stockholm, Sweden, since it was to be our shortest time in port (7:30 – 1:30), yet the cruise ship docks are the farthest away from the City Center (about a 15 minute drive). So we compensated by rising early (about 5 AM) and managing to be one of the first couples off the ship. As a result, we had Gamla Stan, Stockholm’s charming Old Town, to ourselves for much of the morning. The entire day turned out great and Stockholm ended up being a favorite for both Lee and I. 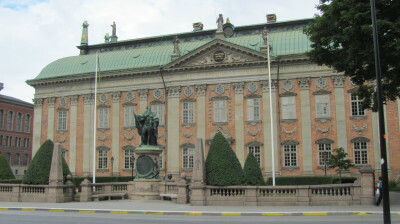 The shuttle bus dropped us off just across the river from Gamla Stan (buses are not allowed in the Old Town), at a spot from which we could see the huge Royal Palace. 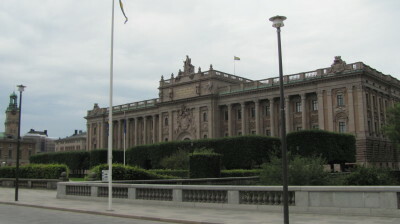 On the way across the bridge we passed directly in front of the Swedish Parliament Building which sits on its own little island. The city of Stockholm is actually composed of fourteen (14) islands so there are many bridges here. Gamla Stan, the Old Town, which sits on a separate island, is a well-preserved, Medieval village with narrow, cobblestone streets and quaint shops and restaurants. Our first stop was the Cathedral, the oldest church in the city (13th century). Its facade is unusual, compared to churches in the remainder of Europe, and its bell tower rises high into the sky. Nearby is the smallest statue that I have ever encountered. It is called the Iron Boy and is dedicated to the orphans who worked at the city docks. 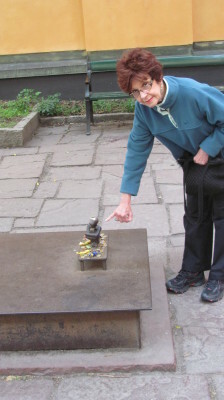 People leave coins at the base of the statue as donations. 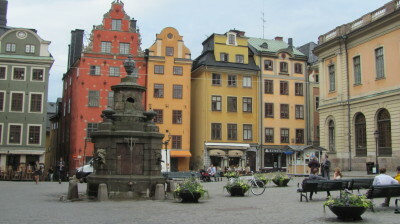 Next, we stopped in the Main Square of Gamla Stan, Stortorget, a delightful space surrounded by interesting and colorful buildings. We had the square to ourselves so we bought coffees and a delicious pastry and sat, enjoying the ambiance and the tranquility. 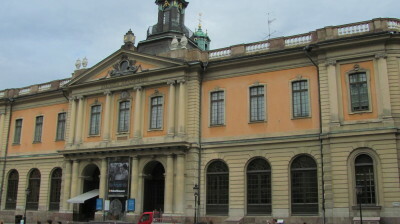 The most significant building on the square is the Nobel Prize Museum. 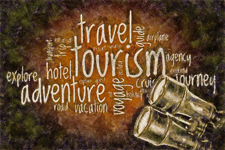 From here we simply wandered the cobblestone streets, discovering, among other interesting tidbits, a Viking Rune Stone marked by a cannon barrel. 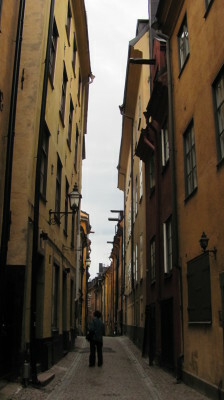 Prastgatan Lane was an example of a typical street in Gamla Stan. 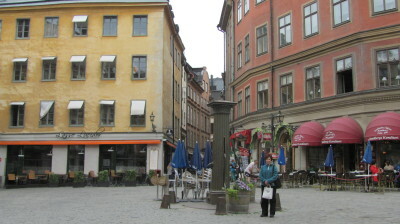 We found another quaint little square, Jarntorget (Iron Square). 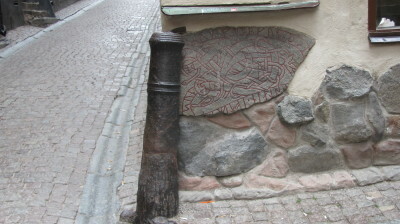 It seems that iron was a major commodity which was traded through Stockholm. 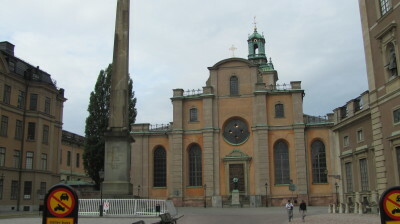 We left the island of Gamla Stan to visit some other nearby sections of the city. 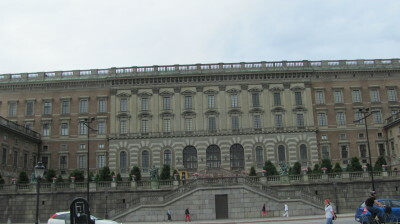 There we saw the House of Nobles, a regal-looking edifice. 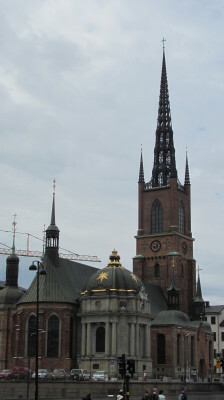 We also noted the Riddarholmskyrkan, the church that contains the remains of many of Sweden’s monarchs. 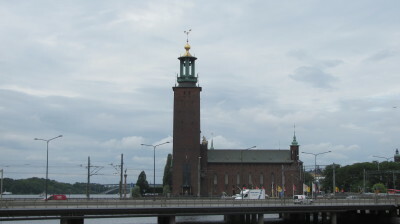 Stockholm’s City Hall, a dramatic red brick building sits on another island, west of Gamla Stan. 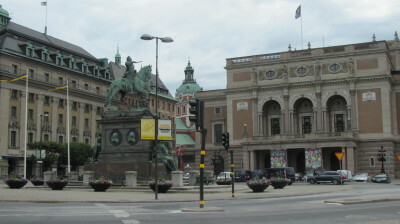 We ended our walk in Gustav Adolf Square, where our bus dropped us off; it is perhaps the most elegant square in the city.